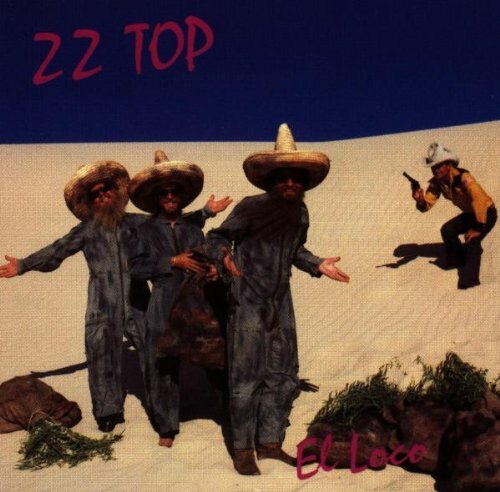 “I bet you can’t work out these lyrics” said a friend in 1986, holding a copy of ZZ Top‘s El Loco album with an evil glint in his eye. I guessed it couldn’t be too tricky. Child’s play. The sort of thing that I could probably sort out whilst a) assembling some flat pack furniture and b) patting the top of my head with one hand whilst moving the other hand on my stomach in a circular motion. Easy peasy, as the saying goes, lemon squeezy. Sadly, the song turned out to be ZZ Top’s Ten Foot Pole, a brilliant song that I hadn’t heard until that point, which is only blighted by being as articulate as one of the blunter minds in the Premier League’s toolbox (say, John Terry at 3am after downing fifteen WKDs in China White). It turned out that deciphering the lyrics to Ten Foot Pole would have caused even the Enigma machine to complain of a headache and tummy pains and dive under the duvet for the day. Imagine Vic Reeves taking the microphone and doing his Shooting Stars “Geordie pub singer” routine. In Norwegian. So what, I hear you ask, could possibly be so tricky about the lyrics of a song? In times when we can send singer-songwriters into outer space, surely it is not beyond the wit of man to achieve such a simple task? That afternoon I singularly failed to decipher the lyrics. However, I was not to be beaten, and some twenty six years later, I have decided to try again: Live! (NB due to a lack of clever technology, the only way for me to do this is for me to listen to the lyrics, and transcribe and translate live right now. You, the reader, will have to use your imagination that this is a live feed. OK? OK. If you want to have a go too, use the Spotify link below. We can translate this as “Try the things that you want me to but any little thing that you want me to”. Clear as day that. You know what? I think we do know what shape you are in. The only other person I ever heard talk like this was clearly off their face on a toxic blend of tequila and peach schnapps (long story). Back to the song. Er, “Try to find what you want me to” again? That’s that “Let it hang what’s wrong with you” line again. Is it “her” or “it”? So what do I conclude? I think it’s about a guy who’s girlfriend wants him to do something that he wouldn’t touch with a ten foot pole. But I’m not entirely sure. Compared with my translation, John Prescott comes across as positively eloquent. * with thanks to “The Thick of It” for that lovely phrase. A great analysis! I could not do it better! Dangs fodah mafren. Ah goddinow. I didn’t realise Elvis was in ZZ Top. Still, behind those beards, it could be anyone. Cheers to ERTAS for the translation. I feel he went the easy way and picked a pretty simple lyric, but hey! Good for you. In the meantime, Thars a dang ana ding doo itan beegon. Sorry I took the easy route…. I always thought that the lyrics were just gibberish. I’m probably not far off with that statement. One of the greatest bands in history, hands down. The story I heard is, Billy went to Nepal. On the treck to an unknown village in search of rare artifacts, Billy and the sherpas spent the night camping in tents. He witnessed the sherpas consume some sort of ritual liquid concoction and, ten foot pole is what Billy says is the closest recreation of the chanting from the psychedelic driven sherpas . with a rockabilly beat of course. I met Billy in the early 90’s at a restaurant on the Hollywood strip and asked him to help me with the lyrics. His comment was they needed a tenth song and they had the riff and song down. But he hadn’t finished what little lyrics they had. And this was the resort of necessity being the mother of invention. Hi Patrick – that’s brilliant. Thank you for asking the question and solving the mystery!